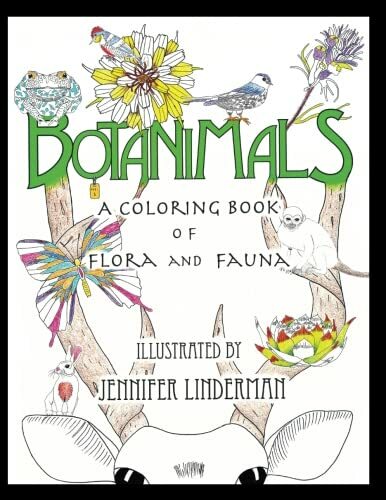 Coming soon...my very first COLORING BOOK, "Botanimals, A Coloring Book of Flora and Fauna"! This is my cover image before I receive the proof in the mail next week. It is a coloring book for all ages including all of my own hand-drawn images of nature, namely animals and plants/flowers. There is an underlying wordplay theme throughout making whimsical connections between animals and accompanying botanic names. It has truly been a labor of love taking me 5 months to complete and having had to learn much about self-publishing. My book will be available on Amazon very soon and I cannot believe it is actually happening. Now the marketing fun begins! This is one of my included "hints" as to the kind of the plants which will be found inside my coloring book. Since then, I warped the text next to each image to curve around the images for a nicer overall design. I find it helpful to show the "behind the scenes" process so others can see how finished products evolve over time. Here is another one of my "hint" pages for my coloring book. The last of three "clues" as to what will be discovered inside my coloring book. I made cards from my plant "hint" pages as they seemed lovely on their own. They can either be colored in or left untouched. Here I have used colored pencil to begin adding color to one of my cards. I finished coloring in one of my Botanic Cards. It was too much fun! This is a printed version of the cover to my Coloring Book. It took many re-workings to get it the way I wanted it to look. Thankfully, I have a good friend who is a talented graphic designer who helped me make adjustments along the way. I do much of my work at the dining room table as I have two kids for whom I need to jump up and help at any given moment so I need to be readily available to help with any "spilled milk".